You might suspect that The Legend of Zelda: Tri Force Heroes is skippable, an inessential spinoff that is more time-killer than legendary adventure. You would be... correct. The newest Zelda, out now for 3DS, is an unnecessary, forgettable installment in a series that usually maintains way higher standards. Even compared to other weak Zeldas like the clunky Spirit Tracks, Tri Force Heroes is disappointing. While the game can be good and even great under the right conditions, those conditions are so rare—and so hampered by Nintendo’s inadequate online tools—that Tri Force Heroes lands with a resounding thud. I don’t recommend it. Tri Force Heroes, like Nintendo’s 2004 experiment Zelda: Four Swords Adventures, is a multiplayer spinoff designed to be played not by a single adventurer but by a group of likeminded puzzle-solvers who work together to overcome obstacles and kill monsters. There’s a plot reason for this: The king of some kingdom (uh, “Hytopia”) has gathered a bunch of heroes to save his princess from a curse that makes her look dull, and as it turns out, those heroes can only fight evil by traveling in groups of three. Rather than guide you through the swamps and mountains of Hyrule on an epic adventure to save the world, Tri Force Heroes places you in a single town and asks you to go out on a series of missions set in familiar locales (a desert area, a water area, and so forth). There are eight maps, each with four different levels. Each of those levels has four short stages, often ending with a boss battle, and three items—one for each Link. One level might require three boomerangs; another might give you bombs, arrows, and a hookshot, then let you figure out the rest. Each player can also put on a costume that will grant buffs or boost item abilities—one, for example, makes your bombs bigger. Another grants you sword beams when you’re at full health. The game both looks and feels like 2013’s Link Between Worlds, with one new key mechanic: Totems. Your party can stack up and form totems of two or three people, which is required to solve many of the game’s height-oriented puzzles. Team members can also pick up and throw one another, which is useful both for accessing new areas and hurling your friends over cliffs. 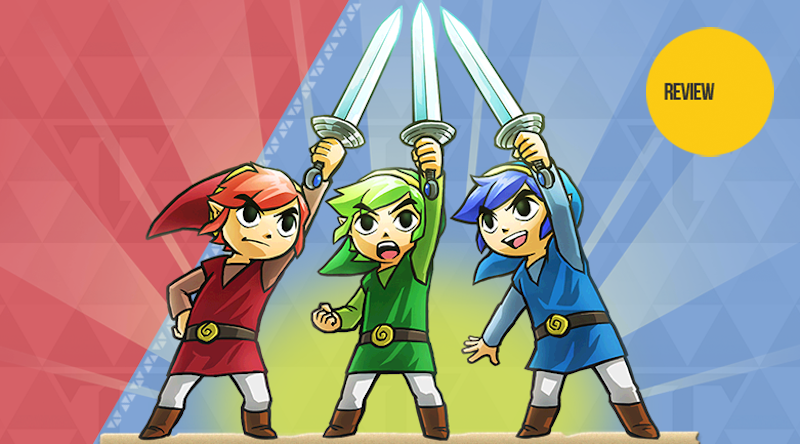 There are a few different ways to play through Tri Force Heroes. If you choose to play the game by yourself—which I don’t recommend—you’ll be joined by two mindless puppets that you can control at will. You’ll have to maneuver and move all three Links on your own, which can get tedious and at times really frustrating when you run into a puzzle or boss that requires precise three-way coordination. Moldorm, for example, is a big worm that will follow around whichever player hit him last, exposing his big ol’ tail for the other two heroes to smack. If you’re playing solo, you’re meant to lure him with one hero and then switch to another so you can hit him. But as soon as you make the swap, he’ll quickly pivot to follow around the Link you’re controlling, leaving you with very little time to get an attack off. It’s quite annoying. The game is clearly designed for three humans. The only way to communicate with your party members—outside of using an external tool like Skype—is by pressing one of eight emotes on the bottom screen. You can signal that you want to form a totem or that you want someone to use an item. You can cheer and pout and scream “NOOO!” in the most adorable way possible. Sure enough, using these emotes properly can lead to some remarkable results. My most satisfying session with Tri Force Heroes actually happened with two random players online. They really got it—they knew exactly when to stack up and when to use items; they knew to let me take the Bow because I was wearing a costume that would let me shoot out multiple arrows at once; they knew when to stop and get hearts because we were all running low. Sometimes, when everything works just right in Tri Force Heroes, you can run into a moment like this, where everyone pulls off a tricky puzzle and cheers in unison, and it is awesome. Lag spikes would fling me off ledges. Players would refuse to move or would use their items at incorrect times. One time, after a couple of rough deaths, the red Link in my party of randoms decided that he’d just jump off a cliff over and over until we got a game over. WELL HEY, AT LEAST I GOT 60 RUPEES. When someone quits or is disconnected from a game, the entire party will get booted, no matter how much progress they’ve made. All it takes is one bad connection for you to have lost 10-15 minutes of your life. But hey, at least you’ll get sympathy rupees. Same thing with bonus challenges—these are modifiers that might task you with completing a level in the dark or under a short time limit. To play with people you know but are not already 3DS friends with, you have to swap 3DS Friend Codes. Nintendo! When you’re playing with strangers, you’ll get to pick a map before you vote on a level—so you don’t have to worry about getting randomly stuck in the Volcano if all you want to do is play Fortress. But if you’re playing with people you know, you’ll have to go through that roulette system for both maps AND levels. Worst of all, players who haven’t unlocked a map can’t actually vote on it. So let’s say I want to play on the Fortress with two friends who have only gotten up to the Woodlands. I’ll vote on the Fortress, but they’ll be stuck voting for the Woodlands, and we’ll have a 1/3 chance of getting the map we want. If we don’t hit it, we have to quit out at the beginning of the level and start again. There is no way to play with only two people. This is extremely frustrating. If you want to group up with your boyfriend or roommate, you’ll have to play online and find a third person to match up with. Let it never be said that Nintendo does not encourage threesomes. Once you’ve started the matchmaking process, there’s no way to back out. This is understandable, I guess, but also irritating. All these factors lead to a game that seems to be trying its hardest to be unaccommodating. When it works, it works well! But most of the time it does not work. Most of the time it’s not worth the hassle. At its best, Tri Force Heroes is a gratifying exercise in cooperation, a game that lets you meticulously solve puzzles with two friends or strangers using nothing but your combined brainpower—and emoticons. There’s something that feels just right about figuring out, as a group, that the red Link has to pick up the green Link who has to throw a bomb that the blue Link grabs with a hookshot and throws at a switch in order to open a path and let you all through. But when you’re playing Tri Force Heroes online, you’re usually not figuring this out. Too often, you’ll be struggling just to get the match you want. If you’ve got three 3DSes and two other roommates, family members, or significant others, then Tri Force Heroes might be up your alley. Expect a lighthearted multiplayer game with a handful of fun, insubstantial puzzles that are best solved with the unified force of three human brains who are working in the same room, without friend codes or lag spikes or random disconnects thanks to Nintendo’s wonky online infrastructure. If you’re playing alone, though? Or if you planned on playing online with strangers and you don’t want to have to suffer through endless game overs and bursts of lag? Probably don’t bother.